Volatility has returned in markets across the world. In this quarter's call, our top quantitative experts discuss how factors have behaved as a result of volatility in the last quarter. Global stock markets have advanced rapidly this year, as fears of recession recede and central banks have mollified investors. Jim McDonald takes a closer look. Stocks have rallied strongly in the New Year – is the rally justified and what is the outlook from here? Jim McDonald takes a closer look. The fourth quarter sell-off in financial markets, alongside more dovish commentary from the Federal Reserve, improved our outlook for risk. We entered 2018 with a significant overweight to risk assets, but steadily pared that back to neutral as risks increased around the outlook for growth and monetary policy. What’s ahead for 2019? Jim McDonald explains. The conflict between slowing global growth and rising rates by the Fed need to be resolved before animal spirits re-engage. Jim McDonald explains. We've moved our tactical risk positioning back to neutral after years of being overweight risk. Jim McDonald explains. Get an inside look at how our top experts are viewing today's biggest headlines through a factor lens. Are we heading toward a pricing cliff for factor-based strategies? Michael Hunstad provides some opportunities to consider when contemplating factor-based investments. Interest rates and credit spreads have increased this year, but we expect those trends to reverse over the next year. Additionally, we think concerns about accelerating inflation are overblown. Jim McDonald explains. Many investors are concerned about recent volatility, but it’s really a return to the norm. However, there are two events we think may cause more volatility in the markets. •Can the Fed be wrong? With the U.S. 10-year Treasury yield decisively breaking 3% this past week, and the Fed likely to hike again in June, CIO Bob Browne revisits our view on rate hikes and bond yields. While the Fed is likely to raise rates in June, we think it could be a mistake. Colin Robertson, explains. Our most recent insights into equity factors around current market events and trends. Find out how timely market events have been affecting equity valuations and returns from the industry experts. 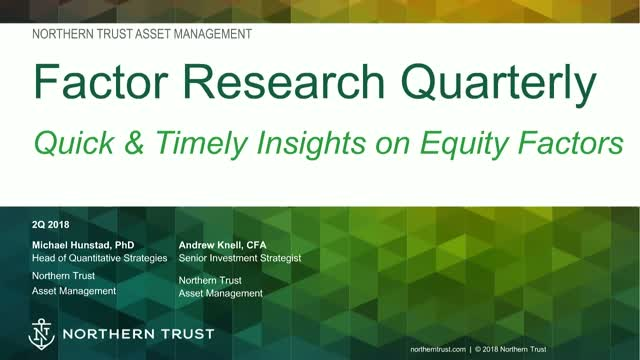 Get Smarter in 60 Seconds - Watch as Northern Trust Asset Management tackles three of the biggest myths surrounding performance, use, and acceptance of environmental, social and governance (ESG) investing. Over recent years we have seen interest in sustainability and demand for sustainable investment solutions grow – this is set to continue in 2018, but what is driving the growth. Join Julia Kochetygova and Emily Lawrence as they discuss the big themes behind the interest and take a look at how these translate in to investment trends and opportunities. The global economy is showing broad momentum and inflation is putting little pressure on monetary policy. Can this global momentum continue in 2018? Jim McDonald explains. With Bitcoin breaking $10,000 and equity markets hitting new highs, it easy to get caught up in market prices. But don’t take your eyes off the true drivers of our economy. Jim McDonald examines the current drivers of economic growth -- and four factors that could derail the market expansion -- in this week's MarketScape. Northern Trust Asset Management is part of the Northern Trust family – one of the world’s leading asset management firms. We are committed to helping financial professionals deliver quality investment products and solutions to their clients.